Canterbury is a large plain stretching from the Southern Alps in the west, right up to the coast on the east. It is therefore well known for both its plains and its mountains. Major towns in Canterbury include Timaru, Methven and Kaikoura. Methven is a well known ski town in close proximity to the Mt Hutt ski area. Both Mt Hutt and Porter Heights ski areas are accessible within a day trip from Christchurch. Kaikoura, on the east coast, is one of the few places in the world where whales can be seen all year round. Scenic cruises on Akaroa Harbour near Christchurch viewing Hector's Dolphins, penguins & seals with opportunities to experience swimming with the world's rarest and smallest dolphins. Operates daily all year round. This full day adventure safari starts by bus from Christchurch making its way over the Canterbury plains to Arthurs Pass in the mountains. Along the way, there is an adrenaline pumping jet boat ride along the Waimakariri River and rugged 4 wheel drive journey across working cattle farms. At Arthurs Pass a stunning scenic train journey through the Southern Alp's on the TranzAlpine travels back to Christchurch. Experience the Ultimate Thrill of Tandem Skydiving with Christchurch Parachute School! Free fall from thousands of feet above the ground at speeds of up to 200 kmph! 7 days, weather permitting. Courtesy van available from central city accommodation. This Track is a 4 day/night Walk or Bike ride over an historic sheep Station, in the hills near Fairlie, 2 hours from Christchurch. You stay in upgraded musterer's huts with flush toilets, hot showers, charming! Your packs are transported from hut to hut so you only walk with a small daypack to carry lunch and wet weather gear. The track is a 50km circuit, magic scenery, great way to explore NZ's high country paradise. Open Nov -April. Groups up to 10 people. BOOK NOW! Enjoy the rafting on the Rangitata River. Really this is good fun and the landscape is magnificent. Do something special in Hanmer Springs. Experience 'A Taste of Italy' in the middle of traditional sheep and cattle high-country. Tour the picturesque olive grove, taste a range of NZ top quality extra virgin olive oils, enjoy an alfresco lunch served with local wine. Advance booking is necessary. Unique holiday cottage built to look like an old wooden church. Perched on a hill and nestled between the mountains and the sea The Artists Retreat overlooks the seaside town of Kaikoura. There are fantastic views overlooking farmlands. A full day tour from Christchurch sets out in the Mount Potts region where Edoras was filmed for the Lord of The Rings trilogy. The bio diesel 4 wheel drive adventure tour shows exclusive photos of the film sets and offers views of the Misty Mountains and Helm's Deep from the summit of Edoras in the films. Commentary of provided by experienced guides with picnic lunch provided. Mt Hutt Ski resort is usually open from June to October (depending of the season). The Mount Cook National park has the biggest mountain of the country. For lovers of climbing. Alan Campbell is a professional fishing guide who practices catch and release fishing, and knows all the best places to fish in the Waitaki district, New Zealand. 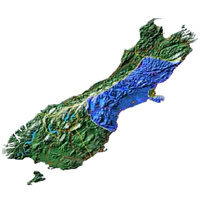 Alan is located in Twizel, in the Mackenzie district. Come and experience the Southern Alps and Mt Cook with Tekapo Helicopters! Our tours will take you on a choice of 5 different flight paths into the heart of the Mt Cook region and West coast Glaciers. All flights include a mountain top landing. Tekapo Helicopters are also available for charters, filming, lifting, weddings, aerial photography and pest control. Visit the home of the South Island's 3rd largest public art museum. Established in 1956 in the house called Aigantighe (pronounced 'egg and tie") which in Scottish Gaelic means 'at home'. This unique art museum holds New Zealand, Asian, Pacific & European art works from the 16th century to the present day including paintings by Frances Hodgkins, C.F. Goldie, van der Velden and Colin McCahon.